Sand production is a serious and growing problem in many oil and gas assets worldwide. It is estimated that about 70% of world’s reservoirs are prone to sand production. Erosion due to produced sand can damage downhole, subsea equipments and topside facilities. Sand erosion causes irreversible material loss of the internal surfaces leading to increased risk of catastrophic failures. Dealing with sand erosion related issues cost operators in billions of dollars annually. Similar to produced sand, black powder (which can be different forms of iron sulfide, iron oxide and iron carbonate, mechanically or chemically combined with other contaminants) in gas transmission pipelines can lead to serious erosion related issues. Present practices of dealing with sand erosion have been to monitor the sand production and accordingly plan component retrievals and replacements. However, there can be erosion related failures requiring unplanned activities to fix the problem. These planned/unplanned interventions are very expensive and time consuming. In some cases operators have the only option to reduce the production rates to tackle the sand erosion problem at the cost of revenue. Current practices and available technologies of dealing with sand erosion are predictive and do not control sand erosion real-time. Industry currently requires a technology that can control sand erosion to optimize the production. The patented “Erosion Control Technology” (ECT) has been designed to control sand erosion real-time by deflecting and redistributing sand in the flow to reduce concentrated effects erosion. Sand particles have been observed to bunch together and stratify under the effect of gravitational or centrifugal forces leading to severely concentrated effects of erosion at the junctions and on straight pipelines. ECT has been designed to redistribute the sand in a cross section to achieve reduction in concentrated erosion. The technology can be implemented either passively or actively in a more sophisticated version. Every ECT solution is an engineered insert design/s tailor made for every operating condition and physical configuration (like bends, blind tees, reducers etc.) to maximize the performance. Active design includes actuated unit with a set of custom engineered inserts which can be placed inside the pipeline one at a time for expected variation in operating conditions over a life of field. INTECSEA has successfully completed the first stage “proof of concept” phase of physical testing. The testing program was primarily designed to prove our calibration with our CFD models with the physical experiment and prove the levels of reduction in erosion rate due to the ECT implementation. The ECT inserts designed for the test conditions have exceeded our expectations and shown substantial reduction in erosion (both global and local) and good correlation between the CFD and the physical tests in both bends and blind tees. 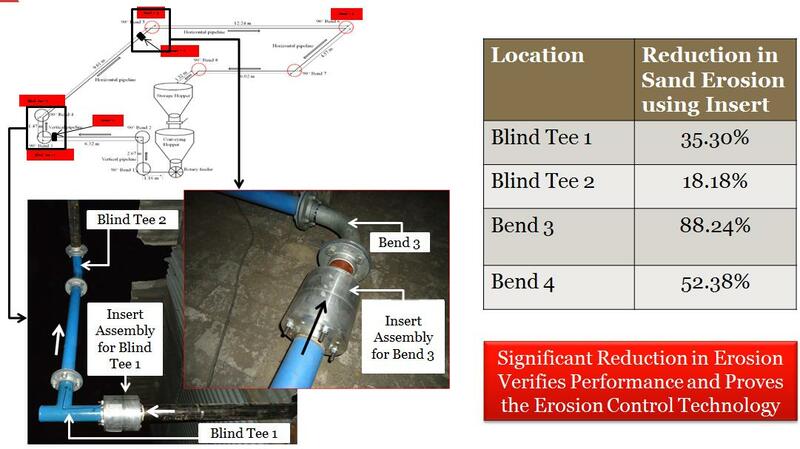 The CFD correlation was a high priority and a key achievement of the test program because both the inserts used for erosion control in the bend and blind tee in the test were designed entirely using CFD methodology. Confidence in this technique is important for prediction of erosion in the field conditions and designing a bespoke erosion control insert solutions. The technology can reduce rate of erosion at the erosion hot spots in a system. This can help debottleneck wells and achieve the flow rates closer to the theoretical maximum a system can handle. This will result in optimized production and enhanced revenue from assets for an operator, approximately (conservatively depending on calorific value) 1M$ increase in revenue for every mmscfd/ year increase in production. 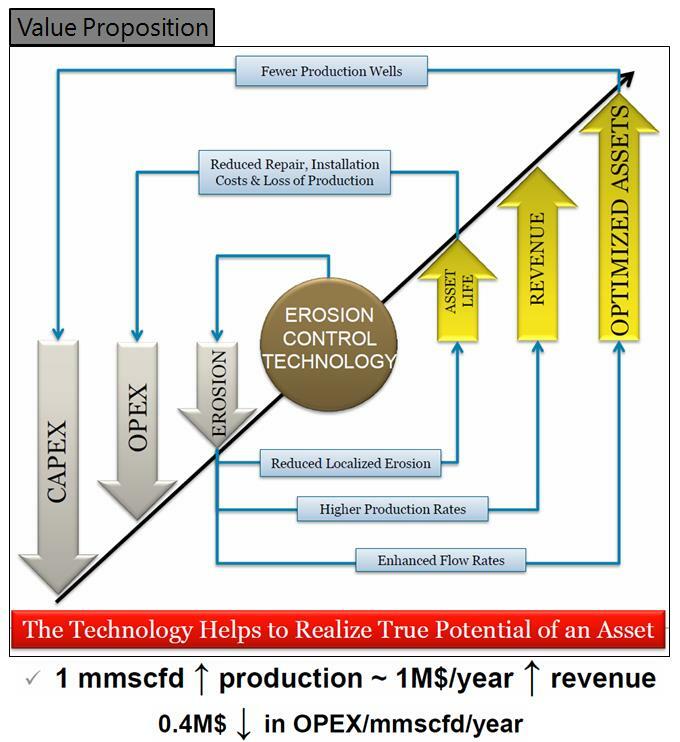 In addition to the increased revenue, reduced erosion will result in reduced interventions, retrievals, production losses which mean considerable savings in OPEX for an operator, roughly 0.4M$ in OPEX savings per mmscfd/year of production loss/year. If the technology is implemented in a Greenfield development then it can potentially help in achieving desired flow rates with fewer wells, which means substantial savings in CAPEX for an operator. Having successfully proven the ECT in a lab test, in the next phase, we would like to engage with interested parties and stakeholders and work together to develop a roadmap toward implementation of this technology into the oil and gas sector. We believe that to do this, further testing will be required at process conditions to achieve the necessary Technology Readiness Level (TRL) as per accepted industry standards. ECT is conceptually very simple and practical solution which can also be generalized to address erosion problems in number of industries like Oil & Gas, Power, Slurry transport, mining and process. ECT insert solutions can be engineered and retrofitted to address issues faced by brownfields or can be implemented during Greenfield developments. It can be practically used for any flow with sand, black powder, cement, coal, ash, or any other erosive particulates.